In northern Assam’s Biswanath, an enraged mob made its way into a polling booth, snatched the ballot box and later, burnt down the ballot papers alleging discrepancies. 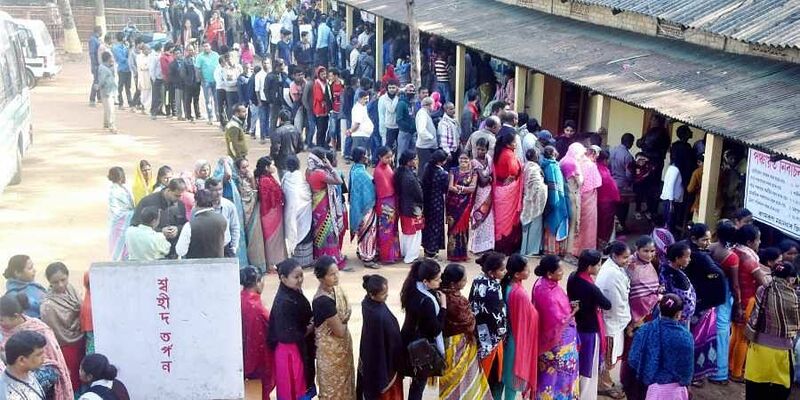 GUWAHATI: One person was killed in the first of the two-phase Assam panchayat elections which was marred by large-scale anomalies on Wednesday. Voting was held in 16 districts to decide the fate of 43,515 candidates. There were altogether 92,19,938 voters. A retired jawan of the Border Security Force, suffering from mental disorders, was shot dead by the police in Golaghat district after he allegedly unleashed a reign of terror with a machete near a polling station. The deceased was identified as Gyanendra Rajkhowa. A large number of people in several districts could not cast their votes as their names were missing from electoral rolls. There were also reports about mismatch in symbols of BJP, Congress and Asom Gana Parishad (AGP) at various places. The State Election Commission has ordered re-polling here as well as in some other places following violence. “Sporadic incidents of violence were reported from some places. There was also mismatch in party symbols. We received reports about people’s names missing from electoral rolls. Re-polling will be held at all the places on December 7,” State Election Commissioner HN Bora told reporters. He added that till 3 pm, 70 per cent polling was recorded. In Upper Assam’s Demow, former Congress MLA Sushanta Borgohain could failed to cast his vote as his name was missing from electoral rolls. Meanwhile, the war of words between allies BJP and AGP has reached the crescendo. The AGP on Wednesday predicted that the BJP would not fare well in its maiden panchayat elections in Assam. “The BJP is doing politics of mud-slinging. It is contesting the panchayat elections for the first time. So, it is very unlikely that the party will do well,” AGP president Atul Bora said. However, BJP president Ranjit Kumar Dass asserted that he would quit politics if the saffron party does not come first in the polls. The two parties have been critical of each other for the past few weeks following their differences over the Citizenship (Amendment) Bill, 2016 which the Centre wants to pass to legitimize the stay of non-Muslim immigrants of Bangladesh besides Pakistan and Afghanistan. The BJP favours the Bill’s passage. The AGP stands opposed to it. The panchayat polls are being seen as a prelude to next year’s Lok Sabha elections. The second phase of polling will be held on December 9 followed by the counting of votes on December 12.